After finding a friend’s post on things she learned as a child (Zee – check out her post too!) so fun to read, I had to do my own! We all learn some hilarious things as children – usually borne out of lies our parents tell us (that could just be me) or doing silly things ourselves (again, could just be me). Not all these things were learning experiences as such, but they are all pretty funny to look back on (except number 2). Enjoy! 1. I got into a LOT of trouble for banging two boys’ heads together when I was seven. I should probably explain – I was not a crazy and/or violent child (which is probably why my teacher and parents were so shocked). I was a massive Cities of Gold fan (and yes, I did watch the entire series again last year when I found it was on Amazon Prime) and in one episode Taub pops up behind two baddies and knocks their heads together. I was stood in line at school (anyone else remember how exciting lining up at the classroom door to go somewhere was?) and two boys were stood facing each other in front of me. The image from Cities of Gold popped into my head and I’m not even sure acting it out was a conscious decision. Makes me wonder whether there’s something in the whole violent programs causing violence in children theory. 2. I was (and still am) frightened of Sesame Street. I have no idea what makes other children love this program so much – it has lots of scary monsters, including one who lives in a bin and a giant creepy bird. To this day I shudder when I think about it. 3. I genuinely thought moths had poisonous wings until a couple of years ago when my boyfriend looked it up to prove to me that it wasn’t true. Thanks to my mum for this one. I imagine it was a necessary lie to tell me, as I loved butterflies and probably found moths easier to catch and stroke, but I never had reason to question it. My mum insists she never told me this, but it’s not the sort of thing you dream-up as a child. I’m thinking it’s more likely she told me so many fibs she’s lost track. 4. I had eyebrows that would have made Cara Delevingne jealous. And I mean huge, furry-caterpillar-like mounds of hair. This one makes me really wish I hadn’t grown up in the 90s, as being teased for my giant brows made me pluck them to within an inch of their life and permanently damage them beyond repair. I now have hair that grows back far under the brows, but a patch on either side just below the main brow that will not grow whatever I do to it. Such a shame I wasn’t born a decade later! 5. I thought baby should be washed in the washing machine. Baby was my little brother. 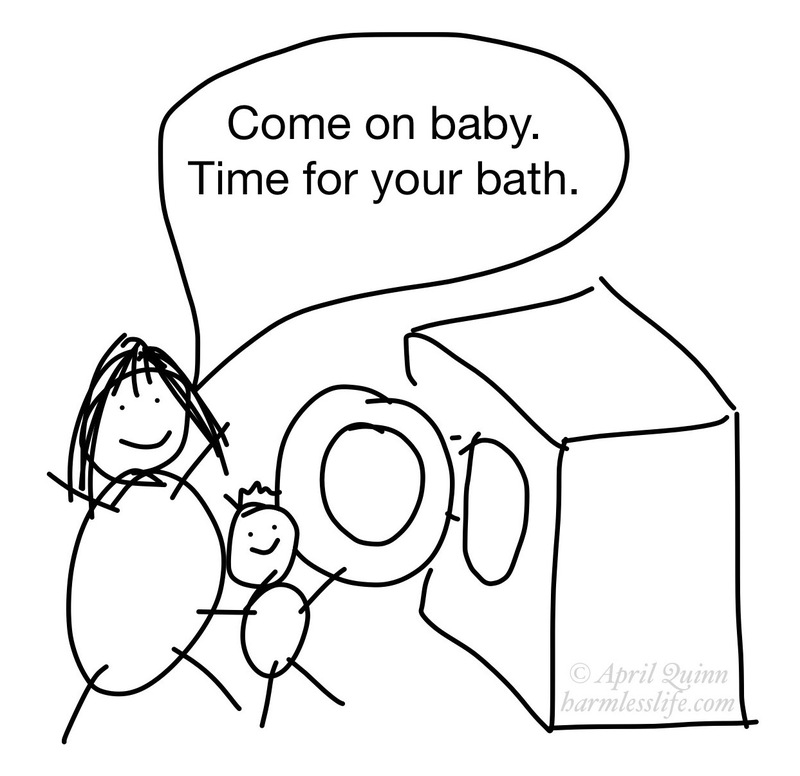 I was a very helpful child, so helpful that my mum caught me just in time as I tried to put him in the drum for a “bath”. I would apparently also shove bottles in his mouth to (helpfully) feed him and scrub his hair with a brush. I was a lovely big sister. 6. At 13 I thought bright ginger hair, barely-there brows and braces were a good look. I still can’t quite believe that my mum helped me to bleach and dye my hair various shades of ginger and red for nearly three years. When I finally grew it out, my hair looked like it had been dip-dyed as I couldn’t get the red to dye back brown – something for which I was teased at the time, but would probably be pretty trendy these days! 7. I broke up with my first “boyfriend” (I was five) because he took home the caterpillar we had found in my garden and made a house for in a margarine tub. My mum made me let him take it and I was so distraught that she had to take me to the butterfly house near where we lived to calm me down. So there you have it – seven funny stories about the little me from all those years ago. I’ll have a think (and conversation with my mum) about other stories and might do another post on this later if people like this one. I’ll also dig out photos to illustrate some of the above if anyone would like to see them? What did you get up to as a child? Did you do any funny things or have any funny lies told to you? Let me know in the comments. Hahaha, omg, kids are crazy! The ginger and baby-bath stories were my favorites 😀 I still can`t wrap my head around someone not loving Sesame Street though hahaha. But I`m glad you decided to make a post about this, cause your childhood sounds hilarious! Hahaha I love this!! It is definitely fun to look back at all the funny things we did. I was definitely terrified of Santa, the Easter bunny, and the tooth fairy.